Lack of physical activity. Not exercising results in poor muscle tone, decreased bone mass, loss of balance and reduced flexibility. Encourage your parents to exercise regularly, focusing on leg strength to improve balance. Tai Chi programs are excellent. Impaired Vision. This includes are-related diseases and not wearing prescription glasses. Have your parents’ eyes checked at least once a year and update their eyeglasses for better vision. Medications. Sedatives, anti-depressants, and anti-psychotic drugs plus taking multiple medications can lead to falls. Ask your doctor or pharmacist to review their medicines – prescription and over-the counter- to identify those medicine that may cause side effects or interactions such as dizziness or drowsiness. Surgeries. Hip and knee replacements leave an elderly person weak, in pain and less mobile than before surgery. Recovery takes time and careful planning to remove hazards throughout the house. Environmental hazards. One third of the falls take place because of hazards at home such as loose carpets, poor lighting and lack of safety equipment. Make a checklist of all the things that need to be done for the safety of your elderly parent. Here are several steps you can take to prevent falls in the bathroom. Install a walk in shower so that it is easy to enter and exit. Install sturdy railings and hand-towels for steadying themselves throughout the bathroom. Provide solid support by placing institutional-grade, stainless steel grab bars around the bathtub for getting in and out of the tub and for lowering and raising the body once in the tub. Support bars should also be installed near the toilet, the position depending on the wall space and the needs of the elderly. Remove bathroom rugs to prevent tripping.. If the floor is too slippery and too costly to replace, carpet the entire bathroom floor. Add a hand-held sprayer to the shower that will spray all hard to reach areas. Add non-stick features to the shower stall or tub. Consider placing a non-slip suction mat or rubber silicone appliqué in the tub to prevent falls when getting in and out or using the shower. Also place a non-skid, latex-coated bath mat on the floor beside the tub. Put a bench in the shower so that your spouse can sit down and then use the spray. Find an arm-level drawer to place everyday items so reaching and bending is not a burden. If renovating, make sure the shower is large enough so that an aid can assist. If renovating, make sure the entry way is wide enough for a walker or wheelchair. Swing-clear hinges can be installed to widen the doorway. Add a toilet seat that is easy to reach if needing a walker or wheelchair. Raise the toilet seat by five to seven inches from the standard 15-17 inch height. 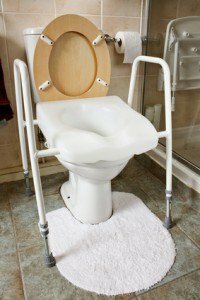 Raising the toilet seat will make it easier to use and prevent falls by giving better leverage for standing. Adapt or relocate toilet paper dispenser. Install mirror for sitting or standing view. Make sure a medical alert system device is easily accessible in case of an emergency. Taking these simple precautions in your bathroom can effectively help prevent falls in your home. You may also be interested in reading about the safest places to live in the us.